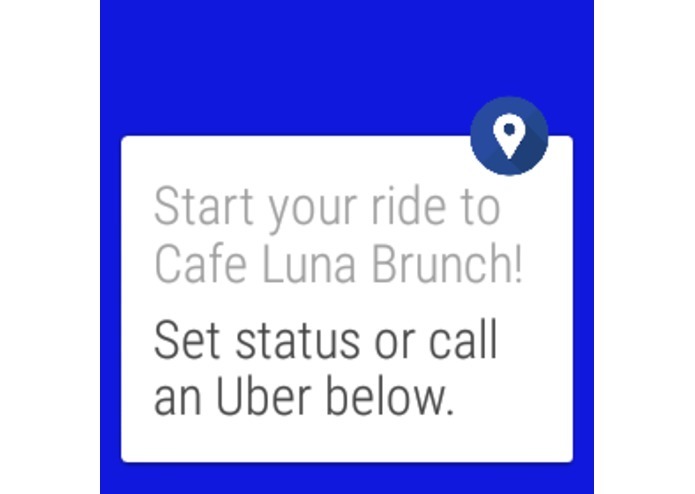 On the Saturday after hearing about the Uber Hackathon, we got a text from our friend Jon inviting us to dinner at an awesome southern bar and restaurant in New York City called Jacob’s Pickles. He had made a reservation for eight that we would lose if we didn’t completely fill, so he asked us to invite a few more people. Over the next few hours all of us invited friends, some of whom later backed out, and Jon eventually realized that he had originally given us the wrong time for the reservation. By the time we thought we had to go, we were unsure if the dinner was even happening or if we were going at the right time, and we had sent more texts than either of us care to remember in an attempt to get everyone on the same page. To cap things off, we were the only two people to make it to the restaurant on time and had to start texting again to confirm that our friends were even coming. Even though the night ended in great food and drinks, it was representative of the frustrations of planning spur of the moment outings. We decided to build Rally to solve that problem. 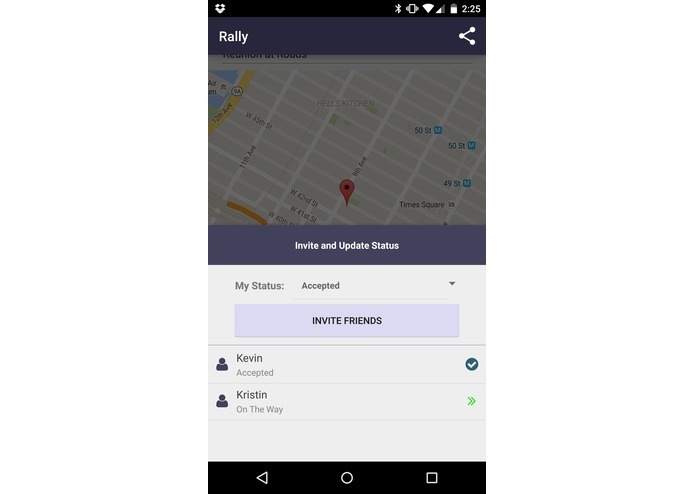 Rally lets you plan impromptu events with friends, making sure everyone gets to the right place at the right time without the confusion and hassles that life creates. 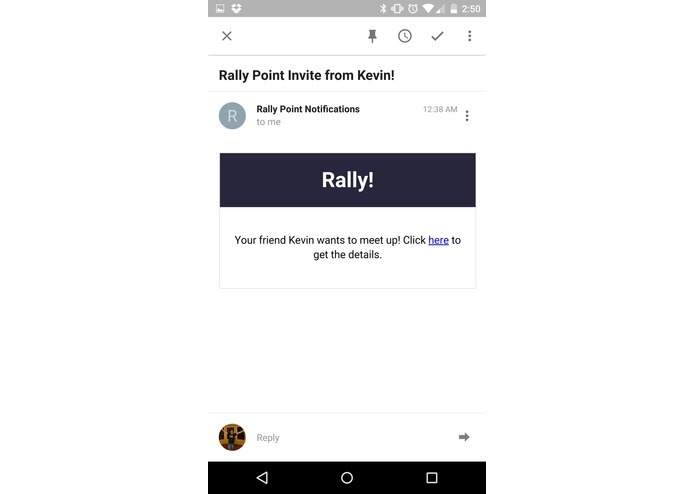 The tools we had before Rally (calendar invites, group texts, and outdated links to Yelp) are not well suited to the needs of planning a same-day event. Succinct Event Details: One glance at the event page gives you the who, what, when, and where in a graphical and easy to digest format. Effortless Sharing: With just a click, you can invite any of your facebook friends, send an email, or shoot a text with a link to the event. 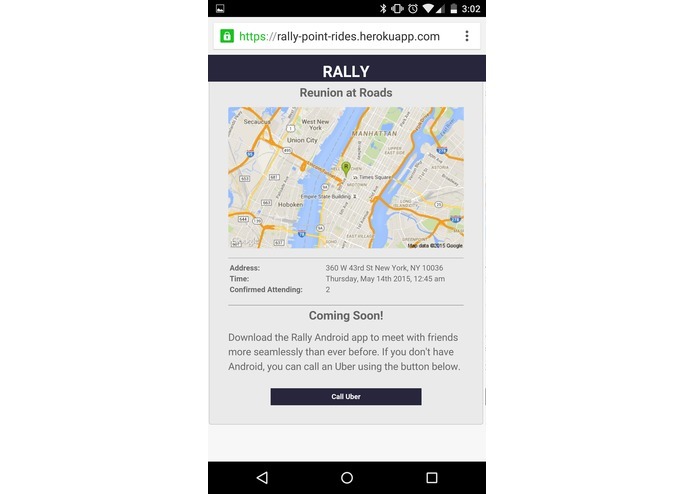 Rally provides all the necessary details on Android or mobile web so there’s no confusion. 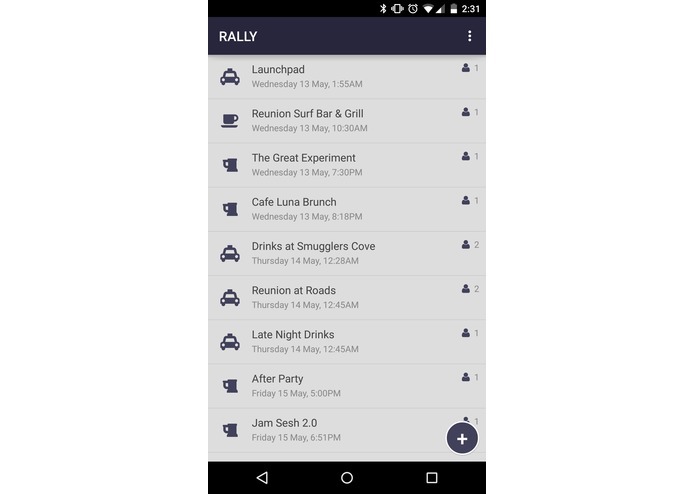 Automatic Reminders: When you join an event on Rally, you automatically get a notification reminding you when it’s time to get going and preventing you from losing track of time. Seamless Uber Integration: From the details page of the event or the reminder notification, you’re two clicks away from having an Uber pick you up at your current location and take you to the event. 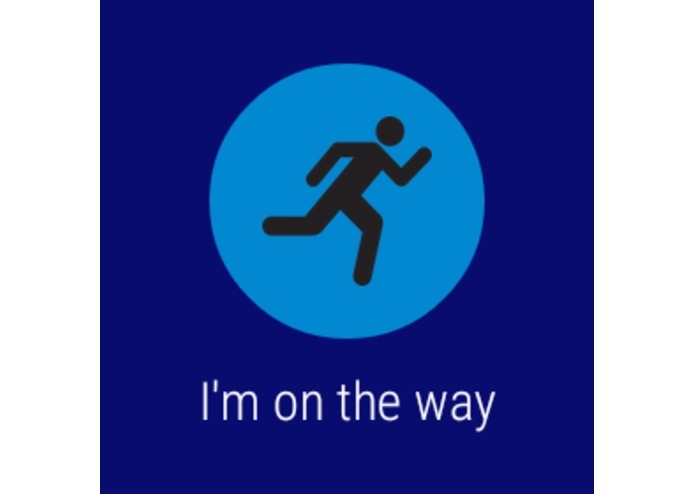 We’ve made it dead simple to be on time. We had a great time developing Rally, and we think it has a lot of potential. We’re really excited to be able to share it with you and others. As evidence of that excitement we leave you with this selfie we took with, Mohamed, the driver of the first real Uber scheduled through Rally’s integration with the Uber Request Endpoint. Cheers! I built most of the Android project, including the majority of the UI and the code for notifications, contact searching, and client-side authentication. 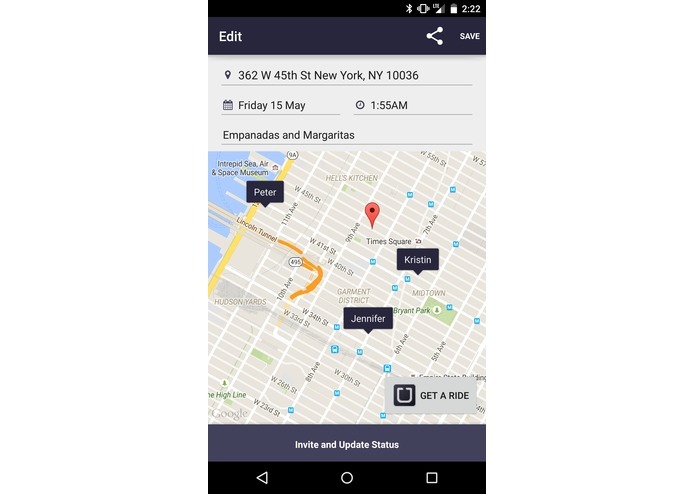 I also designed the app's look and feel from the ground up. Our design was inspired by the simple yet classy style of brands such as Gilt, 4 Seasons, Olio and (of course) Uber. Additionally, I built out our mobile web pages and styled our emails. Peter and I generally had a good balance between frontend and backend work, which allowed us to be much more efficient with our time. I did most of the backend work, including defining and implementing the API consumed by the Android app, configuring the database and defining the schema, and configuring our job queue and implementing email notifications. 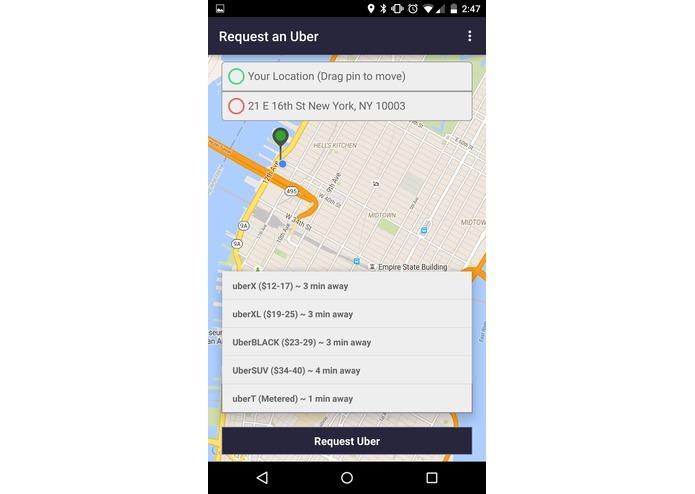 On the Android side, I did the Uber integration (authentication, ride requests and statuses, and product selection and estimates). I implemented user status and location updating and showing user locations on the map. 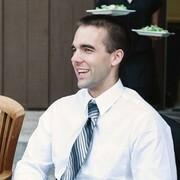 I also implemented sharing links to an event and handling them as deep links into the application. 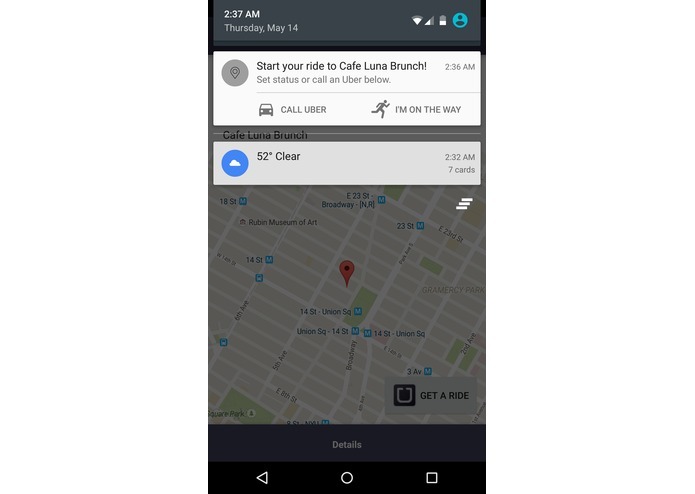 This was my first time working in Android, so I learned a lot about the nuances of the activity life cycle. It was also good practice working on the first 10% of a project on the backend, which has a lot of challenges blending devops and application development, which you don't get much working on a more mature project.